Is Everyone Hanging Out Without Me? 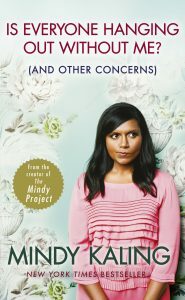 (And Other Concerns) by Mindy Kaling doesn’t take itself too seriously, much like Kaling herself. Kaling’s debut collection of essays is light, fun, and, of course, undeniably hilarious. With titles like “Don’t Peak in High School” and “In Defense of Chest Hair,” you’ll feel like you’re reading the words of your best friend. Kaling’s confidence shines through throughout the entirety of the book. Unabashedly, she explains to what level of fame she aspires: “never hav[ing] to wait in line for brunch” and needing to use a pseudonym when traveling. Often times, celebrities do not call attention to their celebrity status. Kaling does and does so well. Acknowledging her circumstances, however, doesn’t make Kaling unrelatable — quite the opposite. “I’m always worried I’m going to accidentally scratch the kid with my fingernails or something,” Kaling describes her awkwardness around babies. Kaling loves watching movies — especially romantic comedies — even though she lives in Hollywood. In one of her funnier essays, “Franchises I Would Like to Reboot,” Kaling mentions Ocean’s 11. She proposes a prequel citing a need to “cut out the ragtaggiest of the ragtag bunch.” Ironically, a real reboot of the film features Kaling and makes her essay even more apropos. Although not a central focus of her book, Kaling also expresses her desire for marriage and children. She admits to crying when she thinks about the world’s changing values. “[F]ewer and fewer people are believing it’s cool to want what I want, which is to be married and have kids and love each other in a monogamous, long-lasting relationship.” It may not be the fairest generalization because people are often subjected to more pressure to get married and have children than not. Although she has what some would call “traditional values,” it’s important to note that she didn’t feel unaccomplished or incomplete without a husband or a child. “I am thirty-two and I fully feel like an adult,” she writes. How refreshing! Kaling seems aware of, and thankful for, her great career, loving family, and close friends. Incredibly beneficial and beautifully empowering for young women, Is Everyone Hanging Out Without Me? steals hearts without even trying, much like Kaling herself.